Our sailing season will soon be ending. From what I've heard from other members of our sailing community, it's been a very good year--lots of time on the water, lots of fun, a great learning experience, and pride that we are all part of the larger Chicago sailing community. Last night, we had a wonderful end-of-season party which is the traditional wrap-up to our sailing year. But, since the party was a little earlier than usual this year, if you've still got the urge to sail, there are a couple of weeks left in which you can do so. 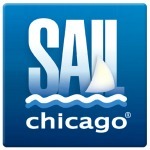 about Sail Chicago until next year. Remember, one of the reasons we're able to successfully fulfill our mission is that we are an all-volunteer community of dedicated sailors. That means we all need to "pitch in" to help make the organization run effectively. Service time is one way in which we can do just that. Although first-year members are exempt from service time requirements, members starting their second year must have signed up by May 1 to complete their requirement. All other members must have fulfilled that requirement by May 1 if they want to secure on-the-water privileges. sails, and keeping our trailer organized. While it may sound like a lot of work, it's also fun because in addition to keeping our fleet in tip-top shape, you'll have a chance to meet new sailing buddies, learn more about our boats, and swap yarns about the past sailing season. So, when you see a notice in your inbox or in an article in Between the Sheets requesting help, please respond with enthusiasm. 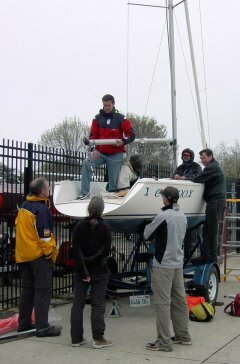 This season, our Sail Chicago instructional program was pleased to grant skipper status to upwards of 60 new skippers! 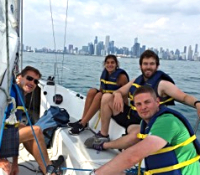 To our new skippers, please take advantage of all the opportunities Sail Chicago offers to get out on a boat and practice to enhance your learning. To our veteran skippers, please remember back when you learned from a veteran sailor and think about becoming a mentor yourself through Tiller Time, Member Cruise Outings, etc. Many hearty thanks to Marjorie Benson who keeps records and maintains our skipper learning database. Additional hearty thanks to Alex Pedenko who has overseen and corrected more than 200 Sail Chicago written skipper skills tests and who will need to hand-over this task in the coming year. Please contact our Service Time coordinator, Frank McNamara, and/or me, if you are interested in taking over Alex's test correction duties. To raise the skills of our instructors and continue to align our instruction program with the US Sailing certification process, Sail Chicago has adopted a goal of having all of our instructors pass the BKI evaluation in the next three years. 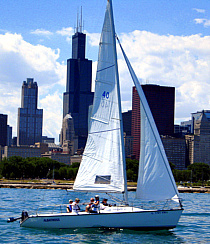 Sail Chicago will provide financial support as well as provide a get-ready-for-certification training program for our instructors. BKI Simeon Stairs helped with a general framework for this plan, and now BKI Monte Lewis has been organizing our training and logistics for this Initiative. Thanks to Monte, who has organized on-land, on-the-water, and virtual training, we had seven of our instructors going through the program this season. Monte has also collaborated with the instruction program at Columbia Yacht Club which has been invaluable to our drive and has also helped strengthen our partnership with Columbia. The Sail Chicago Board met at the offices of Morningstar, 22 West Washington, at 7:00 p.m. on September 13. Matt Stuczynski reports that we now have several new U S Sailing certified keelboat instructors after a summer of well-coordinated practice sessions. Congratulations! Safety Director, John Lemon, recommended actions be taken on several incidents occurring during the month. Several skippers will be held partially financially responsible for damages to the boats. Other actions involved the revocation of skipper cards. Maintenance Manager, Joe Cannon, reports that wave action from storms and boat traffic has been pummeling our fleet which is now moored close to the mouth of Monroe Harbor. Damage has resulted. Joe will meet with Westrec to determine options for moving our boats. Secretary and Cruising Boat Coordinator, Bob Lapin, is moving to Cleveland in October. His duties will be assumed by Maureen Huston, who was welcomed to the Board to complete the term of Maya Teleki. The next meeting will be held at 7:00 p.m. on either October 9 or 11 at a location to be determined.